Rev. Samson Adedokun visits a monument to Thomas J. Bowen in Ogbomoso. 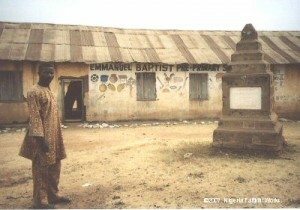 Thomas Jefferson Bowen, the first Baptist missionary to Nigeria, and his wife Lurana—at the invitation of the king—established a compound in Ogbomoso in 1855. During the American civil war, when the missionaries temporarily left, Moses Oladejo Stone kept the early work alive. From this humble beginning many missionaries and their families came to work alongside Nigerians in the century and a half that has followed, always working in partnership with local people and preparing them to take over the various ministries that were created. 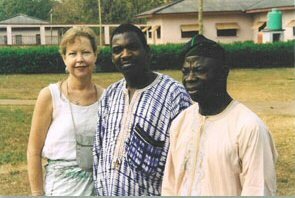 Elaine Orr with Burster Iyere (center) and seminary professor David Adeniran. In 2003 Elaine Neil Orr, an adult “missionary kid” or MK, travelled from the US to Ogbomoso, her childhood home. She met Burster Iyere, the administrative manager for the Baptist Medical Centre, a position once held by her father. Mr. Iyere asked if others who had been part of the mission family might be interested in helping the hospital put in a better well, as their existing wells were shallow and inadequate, and purchasing trucked-in water was a great expense. When Elaine returned to the US, a number of adult MKs joined together to consider what they might do. Becky Neil Albritton, Lisa Jester, Jon Low, Harriet Edwards Michael, Alisa Edwards Smith, Lee Brothers Norvell and Elaine were in the founding group. The fledgling organization began sharing its vision with other MKs and retired missionaries. A leadership council was formed and hammered out a mission statement and model for partnership. Important early contacts were established with Chris Strock, a volunteer engineer, and Terri Morgan of Partnership for the Environment, who made an exploratory visit to Nigeria. In early 2005, the first project was completed through a cooperative effort with Nigerian workers—a successful deep well was drilled for the Medical Centre in Ogbomoso. Over the next 15-plus years, numerous projects have followed in the areas of enhanced health care, construction and renovation, providing water, agriculture and hunger relief. All projects have been made possible through the dedication and skills of Nigerian partners and the financial generosity of donors. During our history, NFW Council members have made numerous trips to Nigeria to strengthen relationships and explore opportunities for new projects. NFW obtained 501 (c) (3) status from the IRS as a not-for-profit charity in 2011.